There’s a new trend growing in communities across the country, as singles and couples in their mid-fifties look for neighborhoods well-suited to an active adult lifestyle. 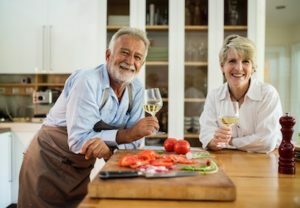 The phrase “senior living” can bring up visions of sedentary retirees whiling away their golden years, but this new trend of “55 Plus Communities” is entirely different. These residents are typically empty-nesters who may still be working or newly retired, and ready to enjoy a life full of leisure activity. The Cottages at Autumn Lake are an ideal choice for the 55+ crowd. The neighborhood does not have an age restriction, but we do see lots of people in their late 50s and early 60s purchasing homes here, and it’s no surprise. Our townhomes and standalone villas don’t skimp on square footage, so you have plenty of room for entertaining, hosting the grandchildren, or for your hobbies. And since we take care of the exterior maintenance, you have more time for bird-watching, fishing, enjoying the pool and clubhouse, or walking our nature trail. The neighborhood is tucked away and quiet, but a short drive to all of the restaurants and culture Savannah has to offer. And if you’re the jet-setting type, it’s a quick trip to the Savannah Hilton Head International Airport. We will soon begin the next phase of development of the Cottages at Autumn Lake. Take a look at our available floorplans, and then get in touch to find out more. We’d love to give you a tour! Only 3 Lake Lots Left in the Village! Share your email address with us and you'll be the first to know about events and specials. We’d love to tell you more about our communities. Please fill out the short form below to get started.